RAZEEBUSS RADICALL SPECIFICATIONS : Radicall XC electric unit is based on a SUP’AIR Skypper pod harness , it’s a carbon chassis supporting a Geiger engineering HPD12 E-Drive unit equipped with 130 cm carbon folding propeller . The main prupose of these auxuliary unit is to prolong a thermal flight . The propeller folds away when not use so it doesn’t destroy the aerodynamics of your pod harness and be used when it’s needed to avoid a potential landing situation and keep you airbone . The power unit doesn’t affect any other aspects of the Skypper harness , which has the same speed bag , integrated reserve , speed bar , etc as an off-the-shelf Skypper . Radicall Unit can launch a paraglider form a flat field , even in light wind condition and that it is very similar to a regular parmotor . 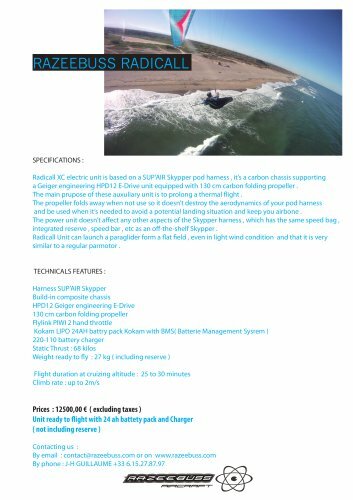 TECHNICALS FEATURES : Harness SUP’AIR Skypper Build-in composite chassis HPD12 Geiger engineering E-Drive 130 cm carbon folding propeller Flylink PIWI 2 hand throttle Kokam LIPO 24AH battry pack Kokam with BMS( Batterie Management Sysrem ) 220-110 battery charger Static Thrust : 68 kilos Weight ready to fly : 27 kg ( including reserve ) Flight duration at cruizing altitude : 25 to 30 minutes Climb rate : up to 2m/s Prices : 12500,00 € ( excluding taxes ) Unit ready to flight with 24 ah battety pack and Charger ( not including reserve ) Contacting us : By email : contact@razeebuss.com or on www.razeebuss.com By phone : J-H GUILLAUME +33 6.